ACOUSTIC EXPO 2013: "I can still vividly remember the moment my perception of the acoustic guitar changed - an intimate gig by Antonio Forcione and his quartet when I was 14. So many more textures, tones, and expressions came from his guitar than I had ever heard before. "It was brilliant, inspiring, and opened the door to a world of incredible guitarists all pushing the boundaries of what could be done with just one guitar. From the likes of Michael Hedges, Thomas Leeb, Clive Carroll, and Stuart Ryan I heard more advanced techniques growing and evolving alongside the traditional methods to give the guitar an arsenal of tones that could give a symphony orchestra a run for its money. "Okay, perhaps an overstatement, but nevertheless the acoustic guitar, it occurred to me, can do a lot. And I mean, a lot. That's got to be pretty high up there in the reasons why the acoustic guitar has seen such an enormous surge of popularity in the past ten years - the sheer variety it offers. "Take the handful of names I've mentioned already for example, all could be put under the same umbrella, but what they do with their guitars is very different. Each has developed their own style in amongst the myriad of different techniques at their disposal - something I, and countless other players aspire to all the time. Combine that with the meteoric rise of YouTube, a folk revival and the likes of Newton Faulkner and Ben Howard becoming household names, and you have the perfect conditions for the acoustic guitar to boom. "It's pretty clear that more and more people are having their own version of my Antonio Forcione moment. When I first started gigging it seemed like there were only a handful of players out and about playing instrumental acoustic sets. Now you'd struggle to find an open mic without some form of percussive or fingerstyle intricacy. "It's great to hear, but what's even better is hearing how creative people are being with it. The composition side of the acoustic guitar has exploded, and the repertoire is growing faster and faster in all directions. The fusions of styles and genre are becoming so varied that now when someone asks what kind of music I play, I'm finding it pretty difficult answering without rambling through a big list, much to their dismay. And I think this trend is only set to increase over the next few years as different musical traditions from all corners of the globe infuse into this surge of guitar composition. "That's another key to this rise in popularity at the moment - its worldwide appeal. New guitar festivals are springing up all over the globe, often dedicated to the acoustic. And it's difficult to ignore YouTube's role in making the acoustic guitar a truly worldwide phenomenon. Spearheaded by the likes of Andy McKee, it's been a fairly massive factor in this new music's accessibility, and an invaluable platform for players of all abilities, from all countries, to share their work as well as get inspiration from others. (And watch cats do stupid stuff. Lets not forget that). "With this new wave of acoustic player has come a crash of new techniques being employed to ever further what can be done with the guitar. Everything from percussive slaps, left-hand and right-hand taps, the seemingly endless forms of harmonics, the scratch plates, the tuning-whilst-playing, the fretboard acrobatics, the impossible alternate tunings. "Visually impressive, and has added yet another dimension to a solo guitar performance. But these weird and wonderful new techniques and tunings are all just simply a means to an end. The really exciting stuff happens when these are combined with a killer melody and rhythm. Then the acoustic guitar really shines, and you can do away with all the analysis of the whys and the hows - the real reason for this new wave of acoustic guitarist is when it's played well and with true expression, not much comes close." 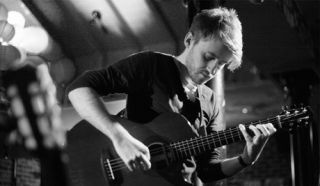 Will McNicol's new album, The Wake Up, is available on iTunes and www.willmcnicol.co.uk. There is also an accompanying book of scores available.